Thailand’s new constitution, approved by majority of voters last month, threatens to undermine religious harmony in the country because of a provision that mandates the state to promote Theravada Buddhism. Therefore, any action interpreted as a threat to Buddhism or a “desecration” of Buddha’s teachings can be suppressed by the state. It is no surprise that the constitution was rejected by voters in Thailand’s southern provinces, a region with a majority Malay Muslim population. Bangkok Post published an editorial supporting Prayut’s decision. The editorial also urged the government to immediately amend the controversial provision of the constitution in order to avoid religious conflict. “It is separatists and their pawns who will use the religious issue in coming weeks and months as a propaganda bludgeon. 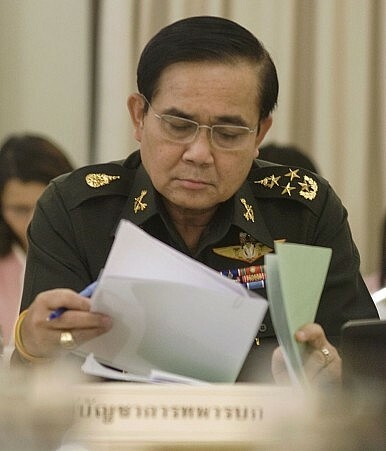 Gen. Prayut supported special action to amend the draft on the issue of the senate. He should consider special amendments to fix this possibly divisive issue immediately,” the newspaper’s editorial argued. But Surapot Thaweesak, a religious scholar, is doubtful whether a mere order can contravene the constitution. “Between the constitution and the order authorized by the junta leader which once is higher? Should the modern democratic society have religious duties as it is written in the constitution or as it is written on the order,” Surapot wrote on Facebook. Another scholar, Khemthong Tonsakulrungruang from Chulalongkorn University, also noted that the order empowers various ministries to promote the “correct”’ teachings of Buddhism. He emphasized that the teachings of Buddhism are personal and can be interpreted in various ways. He warned that this latest order of the junta can make the situation more dangerous by imposing restrictions on religious beliefs. “This order could lead to thought crime allegations. As a result, this order might curb freedom of expression and freedom of religion of minorities, as well as non-mainstream Buddhist schools. The government might like this measure as it provides more control over religious communities,” the scholar explained. Thailand’s new constitution is supposed to boost the government’s national reconciliation program and engender unity in the country. But the clause on religion has already caused division because of its perceived bias against the religion of minority groups. Worse, the proposed remedy of the government could stifle religious freedom by prescribing the teaching of “correct” Buddhism.